For several years, we have been using ground based NDVI sensors pointed at the side wall of Concord canopies to estimate canopy growth across vineyard blocks. Sensors are mounted on a farm vehicle and connected to a GPS antenna and field data logger and data are collected as the vehicle passes through the vineyard. For our purpose, we are using the NDVI sensor in its most basic function of indicating if it senses the presence or absence of actively functioning leaves. To try and capture the variation in canopy growth across a vineyard block, we mount the sensor to point at the actively growing region of the canopy; therefore, in Concord high cordon systems, the sensor is mounted high early in the season and is moved to lower positions as the season progresses. Concord canopy development throughout the season. Scanning is typically done with a single sensor which will be mounted around the cordon early in the season then moved lower as the canopy develops to capture regions of high and low vine growth. Comparison of Concord vine size and NDVI signal. If the NDVI sensor is mounted correctly to capture difference in canopy growth there tends to be a positive linear response between vine size and NDVI between 0 and 3 pounds of dormant cane pruning weight (8’ vine x 9’ row spacing). In large canopies (above 3 pounds pruning weight) there is not a strong relationship between vine size and NDVI. Under this standard vineyard configuration, vine canopies completely fill the allotted trellis space at around 3 pounds so it makes sense that the NDVI signal would also saturate at 3 pounds. Our use of NDVI sensors essentially measures external canopy fill, not canopy density. When is the best time of the season to collect NDVI information? In 2016, we set out to answer the question of which NDVI scan best related to vine size and vineyard yield. Eight commercial Concord vineyards were NDVI scanned at four time points; approximately two-weeks pre-bloom, bloom, two-weeks post-bloom, and veraison. For validation, manual pruning weight sample locations were identified which targeted low, medium, and high NDVI values. In addition, continuous yield monitor data (where available) were collected and compared to the continuous NDVI values. The relationship between NDVI at different times of the season and vine pruning weight (left) or crop yield (right). Manual pruning weights were collected at 30 locations across 5.9 acres and yield monitor data were collected continuously on 2.8 of the 5.9 acres. In this Concord vineyard example, there was a positive correlation between NDVI and pruning weight at each scanning time. The weakest relationship was in the pre-bloom scan and the strongest was at veraison; however, the last three scans (bloom, post-bloom, and veraison) were similar. From a practical management perspective, a positive relationship at the bloom and post-bloom timings has the advantage of giving useful information in spatial vine growth for in-season management decisions, such as for differential floor management or crop thinning. Similarly, there were positive relationships between NDVI at each scan time and harvest yield. 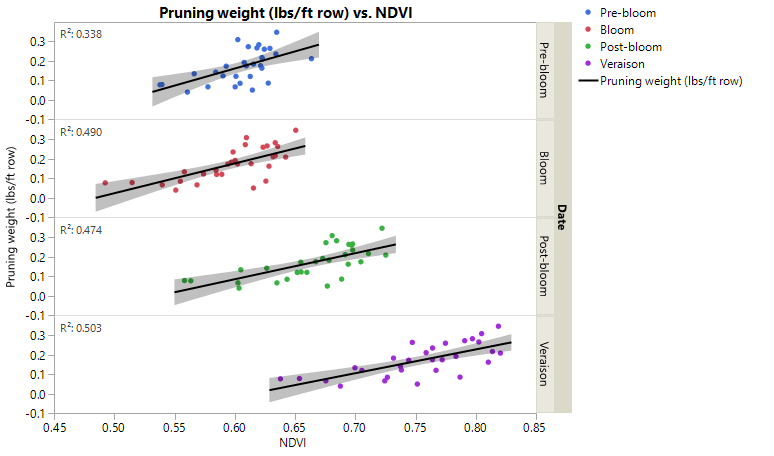 The pruning weight data indicate that the vines in this vineyard ranged from approximately 0.5 – 2.75 pounds/vine; therefore, we would predict a positive linear response between NDVI, pruning weight, and crop potential (i.e. the vines, in general, had not reached maximum potential light interception nor saturated the NDVI signal). As with pruning weight, the strongest relationship between NDVI and yield was at the veraison NDVI scan time; however, the earlier scans also gave positive correlations and could be used for practical in-season management applications such as crop estimation or fruit thinning.